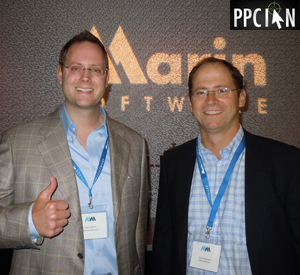 If you’ve been reading PPC Ian for a while, you know that I’m a tremendous fan of Marin Software. Marin Software is an incredible digital marketing platform for enterprise-level marketing professionals, teams, and agencies. Continuing their rapid trajectory of growth and success, Marin just acquired social media platform Social Moov. 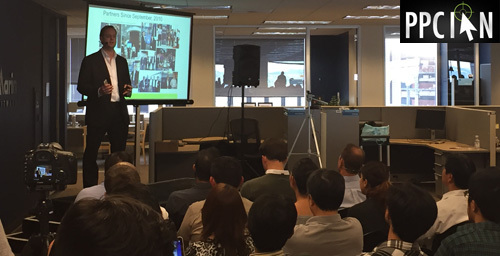 As a long-time client and enthusiast, I recently had the incredible honor of presenting at Marin Software’s all hands meeting. Presenting at their headquarters in San Francisco, to the right is a picture of yours truly and David Yovanno, CEO of Marin Software. I cannot thank David and Marin enough for the great opportunity! It’s motivational moments like these that I truly cherish. 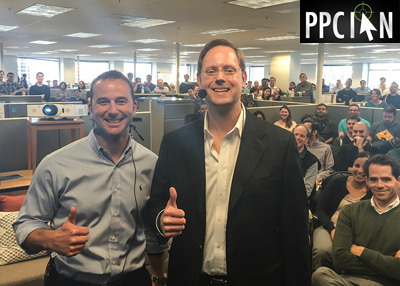 The goal of my presentation: Thanking the entire Marin Software team for everything they do to make my life better! I wanted to take this opportunity to highlight the importance of building strong business partnerships. In the world digital marketing, we work in a truly unique space with amazing people. I view my strongest partnerships as friendships. Thanks Marin for being an amazing partner and friend! 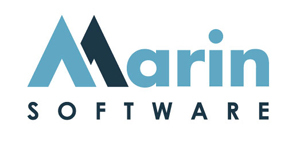 I’m a huge fan of Marin Software. 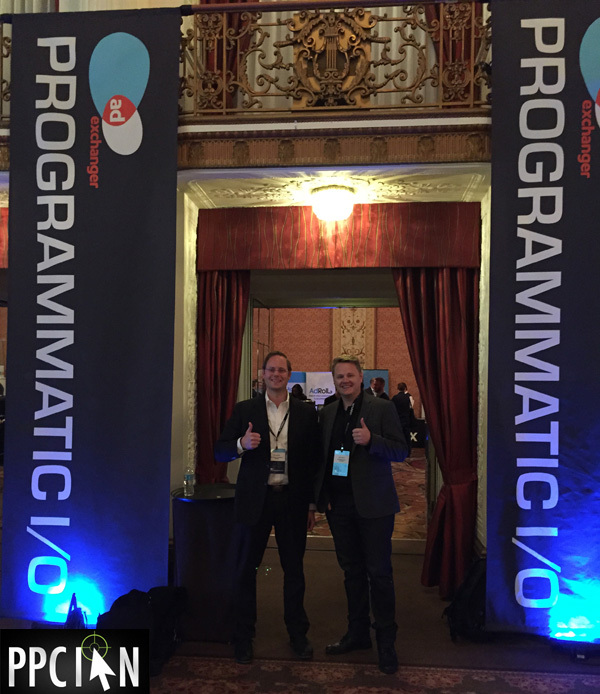 I’ve covered Marin Software here on PPC Ian for years! I’m really happy and excited for all my friends at Marin, just last week they filed for IPO. Marin has built so much momentum over the years, and is a truly amazing platform and company. When it comes to SEM automation platforms like Marin, I’m the biggest proponent around. Marin’s pending IPO truly puts our industry and SEM automation on the map. Want to learn more? Check out the official IPO Press Release. 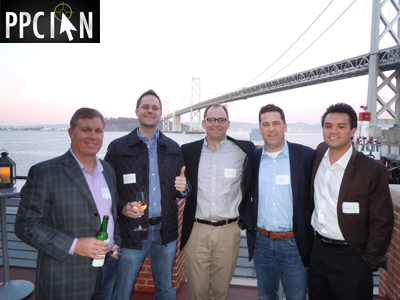 Tonight, I really enjoyed Marin Software’s cocktail party at Waterbar San Francisco. This party provided a great opportunity to catch up with my friends from Marin Software while networking with other online advertisers. Check out the picture below from the party, the venue was unbeatable! 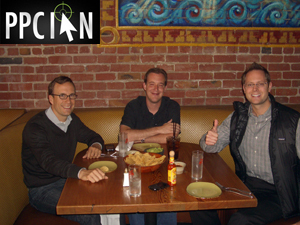 Marin Software truly builds lasting relationships with their clients and partners. Thanks, Marin for an awesome time and congrats on your pending IPO! Today, I attended Marin Masters San Francisco 2012 conference, hosted by SEM platform Marin Software. The conference was amazing, the can’t miss San Francisco SEM event of 2012. Today, I’m thrilled to share my recap of Marin Masters. Some quick background… I attended Marin Masters two years ago. I had an outstanding time, but last year I unfortunately missed the conference (I had a big presentation/event at work that day). I was really sorry that I missed it so this time I was sure to save the date months in advance. I am sure happy I was able to attend this year! It was an action-packed conference, one of the best ever. Hosted at the W Hotel in San Francisco, the venue was amazing. Marin went all out. They reserved a huge room and the attendance was really impressive (it was packed). It makes perfect sense: San Francisco is the online marketing capital of the world and $4 billion worth of online marketing spend is managed via Marin. Marin has a huge family and a world of supporters, power users, and enthusiasts (including me)! This was the place to be. They had free drinks there and truly did an outstanding job from all aspects. They even raffled off a free Xbox Kinect. During the presentations, I listened very closely. I was especially impressed by the Experian presentation. Experian’s head of online marketing spoke all about mobile marketing and had some true insights about campaign structure, landing pages, and going after new opportunities. Yahoo! sponsored the event and also had an amazing speaker. Marin’s head of product management spoke all about the latest and greatest features, focusing on ways to save time each and every day. All of the speakers were truly great, they really went all out. In just three hours, I learned invaluable paid search tips/insights and also strategies for leveraging Marin to the next level. After the conference, I enjoyed several hours of cocktails and appetizers. The drinks and food were amazing. The company was even better. I had so much fun chatting with friends, both new and old. If you’re running big online marketing campaigns, I highly recommend auditioning Marin. They are truly amazing. Thanks Marin for the great Marin Masters conference, I can’t wait until the next one! Today truly was my day! It all started when my good friend Matt Lawson, VP of Marketing at Marin Software, sent me an email this morning. He asked me to check out the brand new Marin Software homepage. So, I headed on over to Marin and could not believe what I saw! I really couldn’t! So, what did I see? There’s a big picture of me right in the middle of the Marin homepage, with a link to my Marin Software video testimonial. Head on over to Marin and check it out for yourself. Also, you can see a screenshot below (click it to see the full-sized version). I’m so honored. Marin Software is one of the best SEM automation platforms around. I personally leverage their platform each and every day to optimize and manage large scale SEM campaigns. I’ve been a Marin Software power user for years and cannot say enough great stuff about Marin, their technology, and their team. Thanks so much, Marin, this is a true honor! And, congratulations on your new homepage, it rocks. I’m a huge fan of creative testing. Just a few days ago, I wrote a post about A Few PPC Ad Copy Ideas. 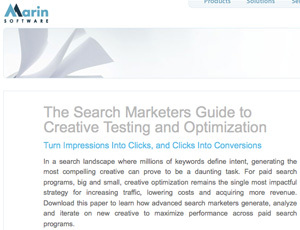 Today, I’m thrilled to share Marin Software’s brand new whitepaper called The Search Marketer’s Guide To Creative Testing and Optimization. Marin offers one of the most amazing SEM Automation platforms ever, and their new 14-page whitepaper delivers some serious value. Covering topics such as maintaining keyword relevance, testing keyword tokens, prioritization of tests, implementing proper tracking, and measuring statistical significance, Marin Software’s whitepaper offers value for both beginner and advanced search engine marketers. I highly recommend downloading this free whitepaper. It’s packed with valuable lessons and is a great weekend read. I went away inspired with some new ideas. I enjoyed the specific examples in the whitepaper and especially the “partner spotlight” case studies for partner, Boost CTR. Back at SMX San Jose 2012, I took a photo with the Boost CTR team. They have been taking the industry by storm and are a Marin Software partner. You’ll get a bit more flavor about them and so much more in this whitepaper. 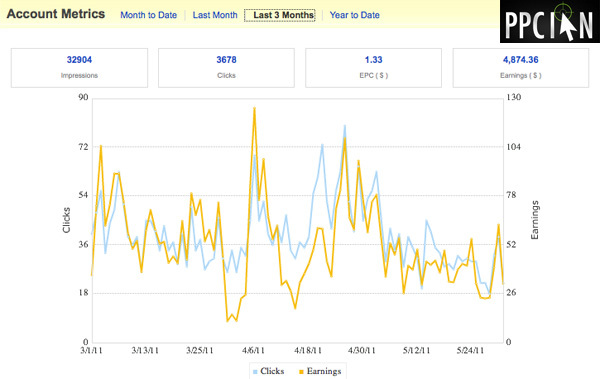 Paid search is all about continuously testing. Keep testing new ads and just remember that it’s all about the entire funnel (impressions to conversions). Ads with the highest CTR are only winners if your back end conversion rate also remains high. I’m a huge fan of Marin Software and have personally leveraged this amazing SEM platform to manage multi-million dollar campaigns. 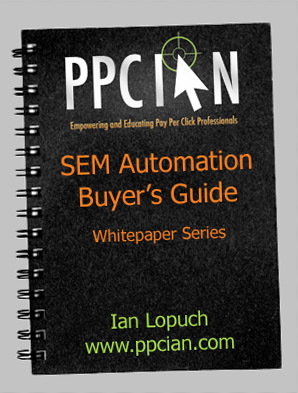 Not only does Marin have an amazing platform and team (including Matt Lawson who I interviewed here on PPC Ian), but they have been offering some seriously great whitepapers – for free! Last time, I reviewed Marin’s Optimization Beyond Bidding whitepaper. 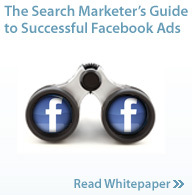 Today, I’m absolutely thrilled to review Marin’s brand new whitepaper: The Search Marketer’s Guide to Successful Facebook Ads. Marin’s whitepaper is free and super easy to download it. You can download right after filling out some really easy info (no email confirmation required). Marin interviewed the largest Facebook advetisers around and compiled their tips and tricks into an easy to digest format. You’ll learn how to leverage your existing fan base to build powerful paid campaigns. You get to tap into an exclusive Razorfish case study, one of the top online marketing agencies around. Marin shares a really neat root analysis concept, a creative and algorithmic way of generating new likes and interests. In addition to tactical tips anyone can put to good use, Marin discusses some of the amazing Facebook features available in their application (with screenshots): Audience segmentation and creative rotation. I’m a huge fan of whitepapers! In fact, I just wrote a FREE 12 page whitepaper all about buying SEM software. It actually took me nearly an entire day to write, edit, and publish that whitepaper so I have a ton of respect for anyone writing great PPC whitepapers. Today, I’m excited to share with you a great new FREE whitepaper I just discovered, Marin Software’s Optimization Beyond Bidding. Before I discuss this great whitepaper, I wanted to first take the opportunity to introduce Marin Software. Marin software is the leading pay per click search engine marketing software solution. It’s the package of choice for corporate search engine marketing organizations. Recently, Marin Software announced that over one billion dollars worth of annual spend is managed by their system. That’s simply amazing. 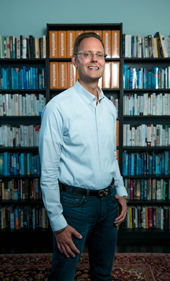 Want to learn even more about Marin Software? 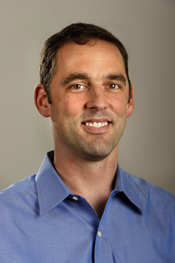 I highly recommend reading my exclusive interview with Matt Lawson, VP of Marketing at Marin. Want to learn more about Marin and other amazing SEM tools? Check out my recent article about my favorite four SEM software solutions. The whitepaper defines the exact mathematical equation behind your CPC (as a function of quality score and also bid of your competitors). 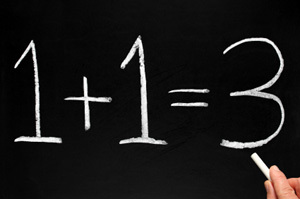 I’m always getting questions about this at work, it’s an equation you definitely want to have handy. It offers several tactical workflows for optimizing your quality score and ROI. My tip: Print these out and post them on your cube. These are workflows you want to live by! Optimization Beyond Bidding identifies the reasons you should focus on exact match as opposed to broad and phrase. This methodology has been core to my personal paid search philosophy for many years and is extremely powerful. Offering real world case studies, Marin’s whitepaper ties its tactical tips to your personal business situation. The whitepaper is sprinkled throughout with handy statistics that will help you in communicating strategy with your executive team. So, what are you waiting for? 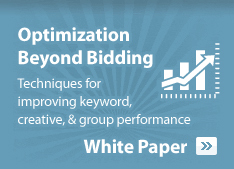 Go download your FREE copy of Marin’s Optimization Beyond Bidding whitepaper. I’m looking forward to hearing your thoughts! I’m a tremendous fan of pay per click automation. I just wrote a FREE 12 page whitepaper all about buying the right search marketing software platform. I highly recommend checking it out! Last Friday, I also wrote all about portfolio theory versus margin maximization bidding models. Today, I’m super excited to continue the SEM automation trend and discuss four of the most popular SEM software tools. Specifically, I’m going to introduce Marin Software, Kenshoo, Efficient Frontier, and ClickEquations. While there are pros and cons with all tools, I’m really going to focus on some of the high level pros of each tool today. At the end of today’s post, I’m hoping you go away with four great tools that you can evaluate for your organization’s SEM program. 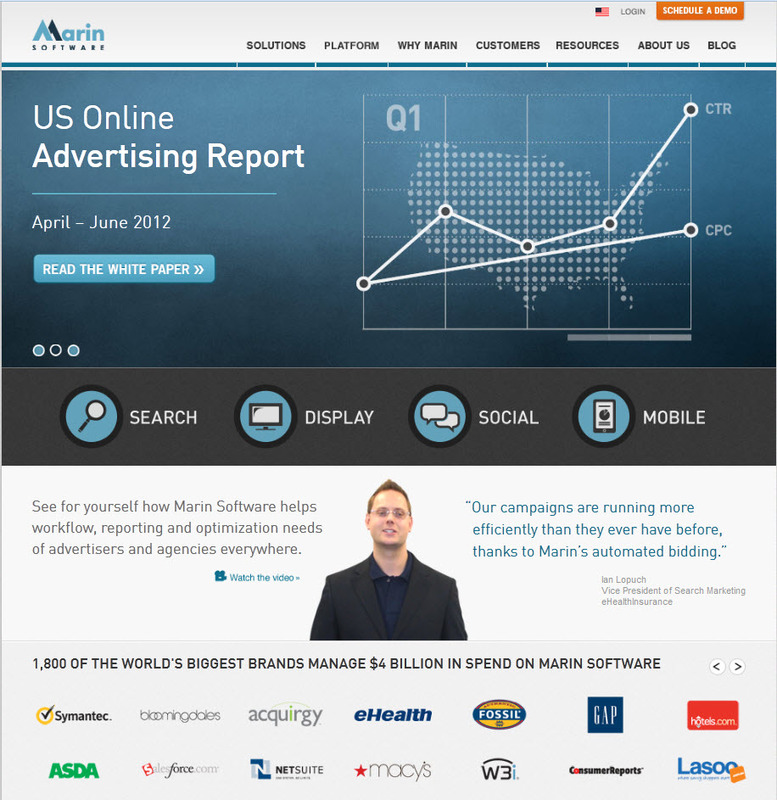 As the largest search marketing application, Marin has over 180 customers and $1 billion in annual paid search spend. This figure is absolutely amazing! More than anything, more spend equals more features (and better features). Marin clearly has the client base to support best of breed innovation. Marin Software has the best account management team, period. I personally know several of the account managers at Marin and give them my highest recommendation. Marin hires the top dogs of the corporate pay per click industry, account managers that can truly add value to your program. It’s actually quite funny: The best campaign managers I know all end up joining Marin! As you know from my last post, I’m a huge fan of the margin maximization bidding model. Marin offers a no-nonsense (anti-black box) bidding model that absolutely delivers. In my opinion, it’s the best bidding engine out there. Marin’s user interface is amazing and polished. If you’re going to be in one application all day, you want one that’s easy to use, visually appealing, and powerful, right? You get all of these benefits with Marin. They truly put the user first. Kenshoo is new! Let’s face it: The search engine marketing industry has matured. I’ve been doing this stuff for over 6 years now and can hardly believe it. The beauty of Kenshoo is it’s a brand new application so its code base is fresh, innovative, and fast. As you may know, I earned my BS in Computer Science from Stanford University back in 2004. 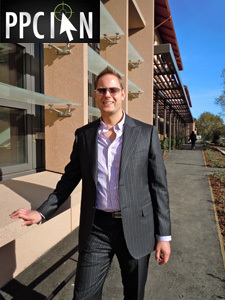 Recently, I spoke all about online marketing at Stanford’s Graduate School of Business. I love technology and innovation. Kenshoo is all about innovation. Their roots are in technology and they think and build innovation like true engineers. If you’re in product shopping, Kenshoo offers amazing crawling technology that will spider your site and link your SEM campaigns into the various nodes of your site. This technology can do some really great stuff such as keeping prices in your ad copy up to date with current prices on your site, and so much more. 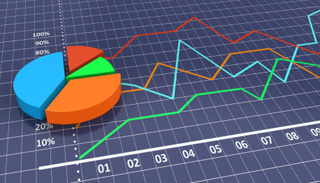 Efficient Frontier offers the premier portfolio theory based bidding model around. As I discussed in my last post, there are two really great bidding models for the corporate setting: portfolio theory and also margin maximization. If you’re under a budget (especially a strict one), I’d definitely encourage you to investigate portfolio theory. How many people work on your team? Do you plan to hire more? Let’s face it: There are many situations where you simply don’t have the ability to hire more team members, but you need more scale. Now, it’s my firm belief that any of the tools in this post will help you in that situation, they all offer scale. However, there’s nothing like the power of outsourcing and agency assistance for maximum leverage. Efficient Frontier is the leader in algorithmic bidding. They employ some of the most amazing PhDs in the industry and can truly take your bidding to the next level. The management team at ClickEquations truly gets it. At SMX Advanced Seattle, I had the pleasure of hearing Craig Danuloff, President and Founder of ClickEquations, talk about Quality score. He presented a quality score whitepaper that is truly the best I’ve seen on the topic. I highly recommend checking it out! After reading this whitepaper, I’m convinced you will be a fan of ClickEquations too! ClickEquations has a superb team. At multiple conferences, I’ve heard Alex Cohen (Digital Alex) speak on behalf of his employer, ClickEquations. This guy always hits the ball out of the park and makes a great name for his company. It’s people like this that truly inspire confidence. I’m a big fan of the ClickEquations Blog. The blog makes a great name for the company and I can’t wait to learn more about this great SEM tool.